This site is designed to provided information and resources to students, parents, alumni, and boosters of the Brainerd Public Schools Music Department located in Brainerd, MN. Our department is made up of student performers grades K-12 and includes 8 Bands, 8 Choirs, 6 Orchestras. We hope you find this site easy to use and informative. Click on any of the links to above for more information. Windfall traveled to Creston, IA to participate in the Real Group Festival, hosted by Southwestern Community College. The choir saw the world-renowned vocal jazz group The Real Group, from Sweden, in concert. Members of the Real Group worked with Windfall in clinics and gave them feedback during their performance. Congratulations to BHS 9th graders Thomas R. (alto sax), Michael K. (clarinet), and Sean B. (trombone) for being selected to perform in the Minnesota Band Directors Association 9-10 State Honor Band! They rehearsed under conductor Dr. Scott Jones from Ohio State University and presented a concert with other musicians from throughout the state on Sunday, April 7th. Registration for 6th grade music is open now. Please scroll down to see information for how to register for band, orchestra, and choir. If you are a 5th Grader and want to join band click on the link below and download the file on the right. Auditions are open for the State ACDA Honor Choir. Click HERE to view practice materials, the audition rubric, and audition information. Auditions will take place at the end of January and beginning of February. ​On Thursday, December 6, the BHS Chamber Orchestra performed holiday music for students at Garfield and Riverside Elementary Schools. On Friday, November 16, the Forestview 7th and 8th Grade Boys Choir performed at the ACDA of Minnesota State Conference. The boys choir prepared six pieces to feature at the conference, performing for an audience of choir directors and teachers. After the performance, the boys spent the afternoon at Grand Slam Family Fun Center. We are so proud of the boys' hard work. Congratulations, boys! See pictures of the day HERE. A professional video recording of the concert is available for staff, students, and immediate family to view HERE. E-mail Mrs. Swanson or Mr. Aulie for the password to view. Madrigal Dinner Tickets On Sale October 30! Click HERE to hear their composition. On Monday Nov. 5th the BHS Bands will hosted the Dallas Brass on their Fall Concert. BHS Wind Symphony and Symphonic Band combined with the Dallas Brass for a piece titled "American Tableau." The second half of the concert was the Dallas Brass's solo set. They brought the house down! Thanks to the Dallas Brass for the inspiration and the BHS band musicians for your hard work! Music Coupon Books Sale Is Here! Beginning Friday, September 21st the 2018 coupon books will be on sale! These books contain over 330 coupons from 130 area businesses that easily pay for the cost of the book and more! For $25 you can save money while also supporting the students of the Brainerd High School Music Department. For each book sold, 50% of the sale goes to helping students afford instruments, supplies, tours, and many other great musical opportunities. Coupon books can be purchased from the businesses listed on the poster, from any BHS music student and online by filling out this form. You may also pick up a book at the Brainerd HS Main office during regular business hours. Buy now before the books sell out! Click HERE to register for 6th Grade Choir next year. Members of the ISD181 School Board, Administration, Support Staff and Music Faculty were honored at this year's BHS Music Showcase Concert. They joined a packed house in Tornstrom Auditorium on Monday April 9th to hear the BHS A Cappella Choir, Chamber Orchestra and Wind Symphony perform their CLC Music Festival sets and also their combined piece, "Homeland." FMS 7th and 8th Grade Choir Winter Concert Live Stream! Click on this link to listen to the live stream of the 7th and 8th Grade Choirs Winter Concert! 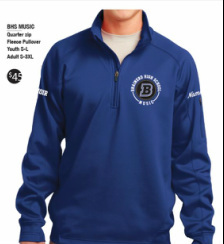 The BHS Music Department is offering a beautiful 1/4 zip pullover for all 9-12 grade band, choir and orchestra musicians. This design is meant to unite the department and will be used in years to come. Follow the link below to fill out the order form online. Checks should be made payable to your school ensemble (i.e.. Brainerd Band, Brainerd Choir, or Brainerd Orchestra) and turned into the High School main office (Fill out blue envelope, turn in to Shelly). If in multiple ensembles, just pick one and notate on order form. $45 with right sleeve embroidery included. Last name on left sleeve for additional $8. The BHS Jazz Ensemble I recently performed at the Chamber of Commerce's Small Business Revolution Reception. Brainerd made the Deluxe Corporation’s Top 10 list of communities to win $500,000 and expert small business support. The event welcomed the members of the Deluxe Corporation's Small Business Revolution Team to Brainerd. The jazz band performed 30 minutes of music for 200+ area business and community leaders. Go Warriors! A huge thank you to Joe Burgstaller, who stopped by Brainerd High School recently during 7th hour for a wonderful clinic with the BHS Jazz Ensemble! He took time out in a very busy touring schedule to swing by BHS and talk to the students about the pursuit of excellence on their instrument and in their life. His insights into the mental aspects of performance were fascinating. Mr. Burgstaller is current distinguished faculty at The Peabody Institute in Baltimore Md and a former member of the Canadian Brass Quintet! Forestview choir shirts are available for order until Wednesday, December 6th. Shirts will be delivered to Forestview and available for pickup on Thursday, December 21st. Order a shirt online by CLICKING HERE or downloading an order form. We have made the decision to have two performances each night we have concerts scheduled this school year. Our first performance will begin at 6:00 PM, and our second will begin at 7:30 PM. The price of admission for the concerts will remain the same ($6 adults, $4 students), and if you pay for the first concert you can stay for the second without paying again. Our Fall Concert is on Monday, October 30. The 6:00 PM performance will feature the Varsity Choir, Encore, and the A Cappella Choir. The 7:30 PM concert will feature Bards, Chorale, Windfall, & the A Cappella Choir. Please feel free to contact Mr. Aulie or Mr. Stubbs if you have any questions about this change. The Brainerd High School Wind Symphony and Symphonic Bands leave on Saturday June 3rd for their tour to Washington D.C. They are performing on the National Mall in front of the WWII Memorial to commemorate the 73rd anniversary of D-Day. Thanks to the Brainerd Dispatch for covering this amazing opportunity with the wonderful article below. The Forestview 6th Grade Girls Choirs are singing "Fireflies," by Owl City, at their upcoming choir concert. Adam Young, of Owl City, sent the girls choir a video wishing the girls the best in their performance. Special thank you to Jenny Holmes for coordinating. The Forestview Choirs are presenting spring concerts on Monday, May 22nd at 6:00 and 7:15 pm and Tuesday, May 23rd at 7:15 pm. The 8th Annual BHS Music Showcase! On Tuesday April 4th, the BHS Music Department will be presenting the 8th Annual Music Showcase. The 7pm concert will feature the A Cappella Choir, Chamber Orchestra and Wind Symphony in Tornstrom Auditorium. These are the three premiere performing ensembles of the Brainerd High School Music Department. Each ensemble will be performing a 15-20 minute set of music that was performed at the Central Lakes Conference Music Festival on Friday March 31st. This is a real "can't miss concert." Come and see the premiere ensembles at the top of their game! The Brainerd High School A Cappella was one of six high school choirs from around the state of Minnesota selected to perform in the Minnesota Choral Arts Finale. The concert was on Sunday, March 26th in Orchestra Hall in Minneapolis. BHS choir students participated in a mass choir directed by Francisco Nunez, the director and founder of the Young People's Chorus of New York City. Mr. Nunez was a 2011 MacArther Foundation "Genius" Grant recipient and is a active conductor and clinician around the country. In addition to the mass choir, each choir also performed a solo set as well. ​Congratulations Brian Stubbs and the BHS A Cappella Choir!! The members of the BHS Jazz Ensemble I were featured at the Friends of the Brainerd Public Library Great Gatsby Event on Friday March 24th at Arrowwood Lodge in Baxter. The band performed music for dancing and enjoyment for one hour. Tickets proceeds supported the Friends of the Brainerd Public Library. Check out this great video of the event! Eight Forestview students have been selected to represent Brainerd in the American Choral Director's Association "Honor Choir" in Mahtomedi on Saturday, May 6th, 2017 The sixth grade students who were selected to represent Forestview include Noah LaPorte, Eli Laposky, Micah Halbersma, Finn Torkelson, Haddy Aker, Nicole Heitkotter, Peyton Hamlin, Edie Chamberlain, and Ellie Jensen. Over 800 students auditioned for the two choirs each year. Students completed an audition, and were chosen by a panel of vocal instructors across the state. Theodore Knudson and Stefanie Maas will complete their all state choir experience this Saturday, Feb. 18, 2017 with a final performance at Orchestra Hall in Minneapolis. Both went through a rigorous audition process last Spring 2016 and attended a week long camp last August in preparation for this upcoming concert. Congratulations Theo and Stefanie! The Forestview 7th and 8th Grade Pops Choir will begin meeting on Wednesday, January 4th at 7:50 am in the FMS Choir Room. Pops Choir is an extra-curricular choir that will be meeting before school on Mondays and Wednesdays from 7:50-8:10 a.m. Any student in 7th or 8th grae choir can join Pops Choir. This group focuses specifically on singing pop music, and the group sings high quality, advanced, and difficult music. Pops Choir performs at all 7th and 8th grade concerts. You can find more information in the letter below, or by visiting the Pops Choir Website. The Lakes Area Music Festival brings the nation's best performers to the area each summer. Enjoy the last two concerts of the season - all events are free of charge. Faculty and Friends Recital: You're Invited! Faculty and Friends of the ISD 181 Music Staff will be presenting a recital to benefit the Brainerd High School food shelf. The concert is on Sunday, May 1st, at 2:00 pm at Lutheran Church of the Cross in Nisswa, MN. Look forward to hearing performances by faculty and supporters of music in Brainerd. Picture Day Pro, of Brainerd, photographed the Forestview 6th, 7th, and 8th Grade Choirs at their first concerts of the year. After each concert, Picture Day Pro sold framed photographs for $10.00, donating 100% of the profit to the Forestview Choir program. ​The Forestview Choirs are excited to accept an $800.00 donation from Picture Day Pro, assisting with purchasing choir polo shirts and funding student attendance at the state honor choir. BHS Junior Featured in MPR's Minnesota Varsity! Hop On The BHS Wind Symphony Fan Bus! 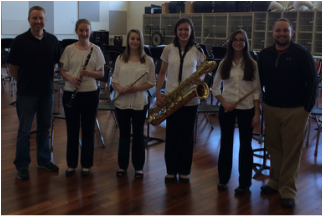 The Brainerd High School Wind Symphony was selected to perform at the 2016 Minnesota Music Educators Association Mid-Winter Clinic. The performance will be Friday Feb. 12th at 2:30pm in the Minneapolis Convention Center Ballroom. The ensemble was selected through a recorded audition process from among bands all across Minnesota. If you are interested in going to this performance and supporting our students, please contact Michele Hilborn in the BHS Activities Office, 218-454-6300, and reserve your spot on the BHS Wind Symphony Fan Bus. BHS Wind Symphony Fan Bus. Bus leaves at 11am, returns at 6:30pm. Please reserve your spot by Monday February 1st. Forestview 8th grader, Jacob Hanson, was chosen to be a soloist with the 2015 American Choral Directors Association of Minnesota's 7th and 8th Grade State Honor Choir. Across the state, over 800 students auditioned to be a part of the choirs. Eight Forestview students were chosen to sing, including Jacob, who was selected as the only soloist at the concert. The students rehearsed and performed on Saturday, November 21st in Mahtomedi, MN. Listen below to enjoy a recording of Jacob's solo, and the State 7th and 8th Grade Boys Honor Choir. The combined BHS 9-12 Grade Choirs, Chamber Orchestra and Wind Symphony performed Carmen Dragon's arrangement of "America, the Beautiful" on Wednesday's Veterans Day Ceremony held in the BHS Gymnasium. 200+ student musicians came together to give honor and thanks to the veterans of the Brainerd Lakes Area. The music department is grateful to be asked to participate in such a meaningful ceremony and is humbled by the amazing sacrifice of area Veterans. Thanks to Brainerd music students, student body, staff and community for making this Veteran's Day one of respect and appreciation! BHS Music Students Volunteer for "We Scare Hunger"
﻿ Hunger. We toughed it out through the rain and had a lot of fun! After bringing 5 overflowing cars to the Salvation Army Food Shelf this morning, we had donated 1,740 lbs. of non perishable food items that will provide resources for families as we are approaching this Thanksgiving season! We have a lot to be thankful for here at Brainerd High School and all students that participated will surely echo how much of a rewarding experience it was." Kalina Vandeputte, Lily Loshcko, Anna Just, John Toven, Danny Roehrich, Peyton McConkey, Jacob Hanson , and Andrew Kirzeder. Eight Forestview students have been selected to represent Brainerd in the American Choral Director's Association "Honor Choir" in Mahtomedi on Saturday, November 21st. Seventh grade students included Kalina Vandeputte, Lily Loshcko, Anna Just, John Toven, and Danny Roehrich. Eighth grade students representing Forestview include Andrew Kirzeder, Jacob Hanson, and Peyton McConkey. Over 800 students auditioned for the two choirs, and 295 students were selected to perform. Students completed an audition, and were chosen by a panel of vocal instructors across the state. The A Cappella Choir will be featured on Classical Minnesota Public Radio (MPR) on Tuesday, September 15, 2015. Tune in to 90.7 FM at 7:15 AM and again at 6:30 PM to hear selections chosen from their performance at MMEA last year. They are featured in MPR's School Spotlight, celebrating music programs across the state every first Tuesday of the month. On Saturday, May 1st, six Forestview 6th Grade Choir students represented Brainerd in the ACDA-MN State 4-5-6 Honor Choir. 860 students auditioned to be a part of the choirs, and 265 students were selected. Students learned six songs for the event, and spent months preparing at home and with Miss Oehler. Forestview was represented by John Toven, Lily Loschko, Kylie Hurlbert, Meghan Barna, Anna Just, and Kalina Vandeputte. Way to go, 6th Graders! 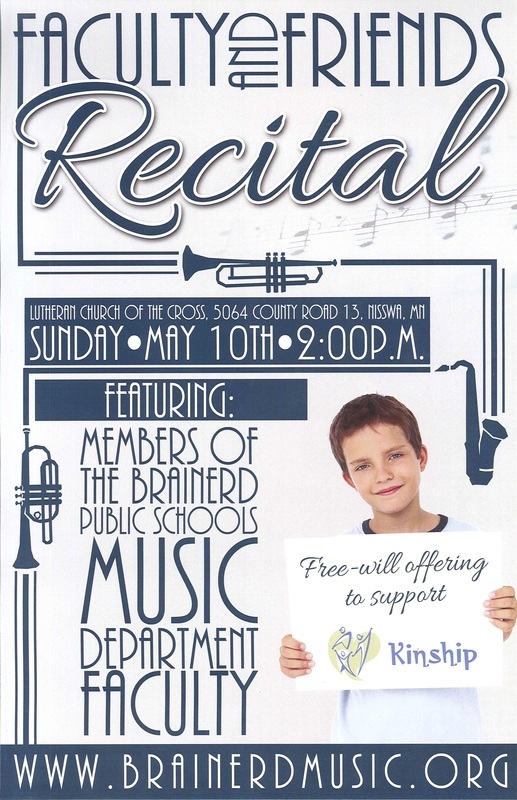 Members of the Brainerd Public Schools' music faculty will be presenting a recital at 2pm on Sunday, May 10th at Lutheran Church of the Cross in Nisswa. The recital will feature solos, duets, and other small ensembles made up of the music faculty throughout the district. A free-will offering will be taken with all proceeds going to Kinship Partners, a local non-profit mentor program that pairs youth in the Brainerd Lakes area with positive role models. For more information regarding Kinship Partners visit www.kinshippartners.org. 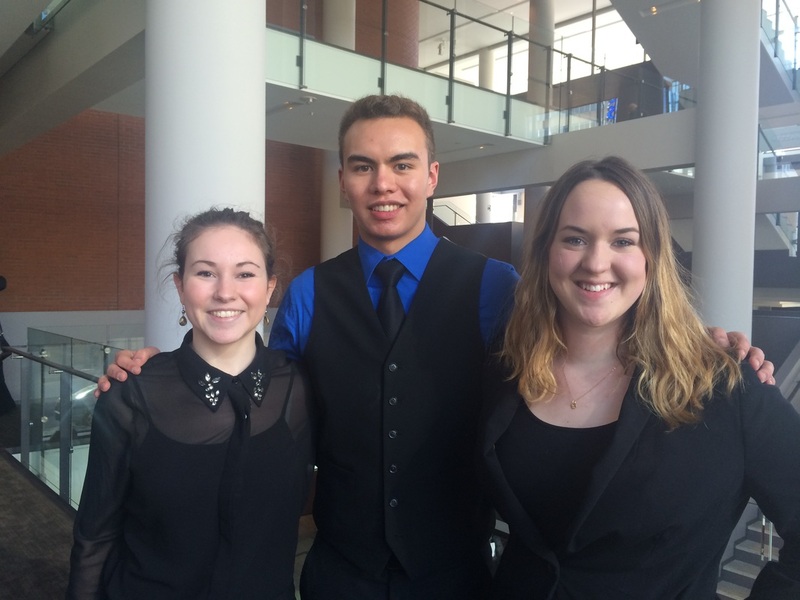 Three Brainerd High School Band students and one Forestview Band student represented the Brainerd Band well this weekend and the 2015 Minnesota Band Directors Association Honor Band held in Alexandria, MN. Mallory Maine, Caitlyn Swartwood, Maria Bell, and Erica Christianson each submitted recorded auditions in December and were selected from all other students in Minnesota to participate. The bands first rehearsal took place on Saturday morning April 25th and continued throughout the day with sectionals and more rehearsals until both bands (7-8, 9-10) presented their concert on Sunday afternoon. Great Job! BHS music students performed in the 6th Annual BHS Music Showcase on Tuesday, March 31st. Every year the top performing ensembles from BHS (A Cappella Choir, Chamber Orchestra, Wind Symphony) achieve their most advanced music making at the Central Lakes Conference Music Festival. This festival is usually hosted somewhere far away from Brainerd and is not seen by our community. The BHS Music Showcase was born out of a desire to share this music with the community that supports and cares for these students. Below is a sample from the performances! took part in 2 one hour masterclasses with World renowned composer and conductor Frank Ticheli, participated in a filmscore clinic at Walt Disney Land where the students performed and recorded the music to several well known movies, and attended a concert at the L.A. Philharmonic. Students were in great spirits throughout the trip and seized the most out of each of these life-changing experiences. The Students also enjoyed downtime at Disney Land, California Adventures, Hollywood Boulevard Walk of Fame, Catalina Island, and a meal at the Hard Rock Cafe. BHS 9th grader, Elizabeth Ortmeier, was chosen to be a member of the 2015 American Choral Directors Association of Minnesota's 9-10 Grade State Mixed Honor Choir. The 125 members of this prestigious choir were chosen from over 600 auditions that were submitted from all over the state of Minnesota. Elizabeth joined the other members of this year's State 9-10 Grade Mixed Honor Choir on February 12, at Central Lutheran Church in Minneapolis, for a day of rehearsals; culminating in a concert for the public that same night. This turned out to be an even more special day for Elizabeth, as she was chosen to be a featured soloist on one of the songs that the State 9-10 Grade Mixed Honor Choir performed. Click on the link below to enjoy a recording of the song that Elizabeth was featured on. She is the first soloist you will hear on the recording. Congratulations Elizabeth! We are very proud of you! Three BHS band students were selected to perform in the 2015 MMEA All-State Symphonic Band under the direction of Scott Hagen of the University of Utah. The students performed at Orchestra Hall in Minneapolis and their selections included, Resplendent Glory by Rossano Galante, Testament by David Maslanka, and the Black Horse Troop, by John Philip Sousa. Each player went through a rigorous recorded audition process and participated in a week long summer camp in August. Congratulations Cassidy, Matt and Catie!!!! 2015 Inter-collegiate Honor Band Participants. From left, Jessica Koehler, Bradyn Watson, Mr. Fogderud, Cameron Trott, Cassidy Trott. Also - NIck Schwen performed at the same conference with the Bethel University Wind Symphony. The music department at Brainerd High School was recently notified that it was selected as a Semi-Finalist GRAMMY Signature School. The department prepared an extensive application in September, and will now submit additional information, including recordings of each of the top performance ensembles at the high school for consideration for the award. If selected as a finalist the department would receive a grant ranging from $1,000 - $10,000 to supplement the programs, and receive recognition as a GRAMMY Signature School. Schools selected as finalists will be notified in March! Three Brainerd High School Freshman band students have been selected to represent the department at the Minnesota Band Directors Association 9-10 Honor Band. Maria Bell, Mallory Maine, and Caitlyn Swartwood, playing Baritone Saxophone, Flute, and Percussion respectively, will participate in the honor band April 25th and 26th in Alexandria, MN. Additional Ericka Christiansen, an 8th grade band student from Forestview Middle School was selected for the 7-8 Honor Band on clarinet. Each student prepared an audition consisting of scales and etudes that were recorded and submitted online to judges from across the state. The students will travel down to Alexandria and work with some of the finest music educators in the state as section coaches, and will be conducted by Dr. Doug Orzolek associate director of bands at the University of St. Tomas. Following an intense day and a half of rehearsals the band will present a concert on Sunday, April 26th at 2pm in the auditorium of Alexandria Area High School. Congratulations!